Remember VHS? Those giant clunky things that gave us films in rather poor quality. And you had to rewind them. Compared to DVD, VHS doesn’t have a shot, but VHS definitely wins in the nostalgia category. There’s something magical about pulling out an old VHS and putting it on, or going into one of the few remaining VHS rental stores. DVD’s better, yes, but like many technological advancements today, it doesn’t have the same magical quality. 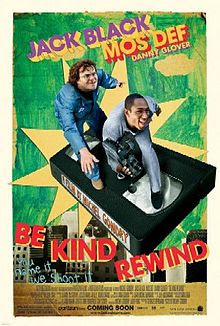 The thing Michael Gondry’s new film, Be Kind Rewind, does best is capturing the nostalgic feeling of VHS; not just that. It’s a good statement about how new technology, while always cool and technically better, can never beat the good old home town feeling of old school tech. Mike (Mos Def) is working at a declining VHS rental store called Be Kind Rewind in Passaic, New Jersey. Mike's best friend Jerry (Jack Black), a strange nuclear activist who lives in a trailer, accompanies Mike while he works at the video store. While trying to sabotage the plant, Jerry gets his mind magnetized, and accidentally erases all the tapes in the store. When customers decide demanding movies, Mike and Jerry decide to remake the films themselves. This is such a simple, yet brilliant concept, and I’m surprised it hasn’t been done in a major motion picture before now. It seems like a fairly obvious idea for a comedy, and the film hits many of the right notes. The first half hour is a bit odd; the event that magnetizes Jerry’s brain takes serious suspension of disbelief, but the characters are all endearing and the dialogue is all well-written. We settle in to the nostalgic feel of the film, and then the humor starts. Watching the duo remake these films is simply hilarious; the best being Rush Hour 2, in which they try to recreate the action scene where Lee and Carter hang from bamboo on the side of a skyscraper. The Ghostbusters remake, as well as their “Lion King” rip-off are also extremely funny. The movie exhibits tremendous creativity in all these segments—in fact, every bit of this movie is very creative. That might also be a detracting factor, sadly. Writer/Director Michael Gondry obviously had a lot of great ideas to shove into this film, and the sum of the parts is not as good is the individual pieces. For instance, I would have liked to see more of the remakes, but it’s an inherent issue in the story that they can’t show more. There’s no way to fix some of these issues in the context of the plot, which crams in many, many good ideas in to 100 minutes. The main plot of this movie is really about the community—these remakes bring the whole community together; friends are made and everyone gets a sense of family. There’s also the struggle between excepting the new world or holding on to nostalgia. About 30 minutes into the movie, we find out the film is actually set in the present, and DVD’s do exist; the shop’s owner, Mr. Fletcher (portrayed by Danny Glover in his first good role since who knows when) doesn’t want to switch to DVD, but ultimately decides he must. I heartily enjoyed the role switch about ¾ of the way through when the younger generation wants to hold on to the videos, but Fletcher wants to usher in the new era. Ultimately, the many messages and plots form a good movie; however, there’s always the feeling of wanting more from the film, in various areas. The community plot is definitely the most developed, and it is the most touching. The film gets the messages across, and you leave the theater with a good feeling. The acting is all very good. Jack Black does his normal be-as-weird-as-possible thing, and for once, it works. I haven’t liked Black in a film since “School of Rock,” but he excels in this role. Mos Def is endearing as Mike, and Danny Glover excels as elderly Mr. Fletcher. The supporting cast, including Mia Farrow and a cameo by Sigourney Weaver, all do their jobs quite well. The directing is also quite good. Setting up the camera to feel amateur in the remake scenes is perfectly executed, and the sharp directing enhances the comedy a lot. So, overall, this isn’t a perfect film. I wouldn’t even call it great, but it is a fun and heartwarming look at the death of nostalgia in today’s world—with some big laughs thrown in. I’d recommend it, if not in theaters, for a rental when it hits DVD (wouldn’t it be interesting if they put this on VHS, just for laughs? ).